In recent years, as the adoption of web standards has meant that most web pages work on all browsers, the browser race has become more about features and providing the best experience for users - increasingly important as work moves online to join play. Rather like magpies, browser manufacturers watch for shiny things that can be nabbed from the competition, and Apple is no exception. Safari 4 (now with Obnoxious Beta Label™) grabbed Chrome's tabs, Opera's Speed Dial, and the location bar from Firefox. But why stop there? We say: Apple, steal these 10 features and make Safari even shinier! Tags are the new black. While you won't remember the name of that site you visited that one time and bookmarked in some folder or other, you might remember a tag you applied to it in Firefox. With Safari, you'll be forever lost, wandering alone in a sea of URLs. Finder has smart folders. iPhoto has smart albums. iTunes has smart playlists. Inexplicably, though, Firefox got the ball rolling with smart bookmarks folders. But Firefox's implementation is dreadful, and Apple should fight back, enabling Safari users to create bookmarks sets via user-defined criteria. Search is increasingly important, and Firefox makes it easy to search websites by typing in a user-defined keyword followed by a search term (such as 'am iPod' to search Amazon for iPods). Safari forces you to go to a site before searching, like it's 2004. If an errant website bombs your browser and you use online apps, hours of effort can be wasted. Google Chrome sandboxes tabs, meaning one dying doesn't take out the others. Rumours suggested Safari was to do the same, but such a feature hasn't arrived. Copied a URL to the clipboard? You need to 'Paste and Go', or so says Opera. Imagine the sheer number of Return and Enter keys that would be saved wear and tear by implementing this feature in Safari, Apple! The Mac has traditionally been a visually-oriented system with visually-oriented users, but Safari's tabs provide no visual preview. Apple should 'borrow' Opera 10 beta's stunning visual tabs, or those from Mac-based Safari rivals Shiira and OmniWeb. 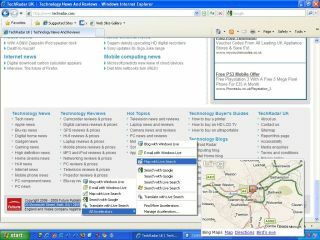 Opera sessions enable you to set up environments for specific online tasks - handy for power users, but also for home users who share a computer among various family members. By contrast, Safari merely offers tab groups. Safari's content blocking is pitiful, grudgingly enabling you to block pop-ups and nothing more. Other browsers go further, but are complex. We think Apple should pinch an idea from Camino, a Mac-based Gecko browser. Its 'annoyance blocking' options might lack configurability, but they're effective. One for the web-design geeks - Internet Explorer has an elegant means of adding browser-specific code (CSS, HTML, and so on) that doesn't rely on scripting: conditional comments. Every browser manufacturer should follow suit, to cut down on hacks and browser sniffing. Safari doing so would be a good start. Apple Mail has data detectors, enabling you to add addresses to Address Book or dates to iCal. Safari doesn't. Strangely, it's Microsoft that's stolen a march over Apple here, with 'accelerators' providing a quickfire means of performing routine tasks based on specific types of data. Quick, Apple - to the swipemobile!